EUROPEAN CHAMPIONSHIPS 2006 IN GOTHENBURG. 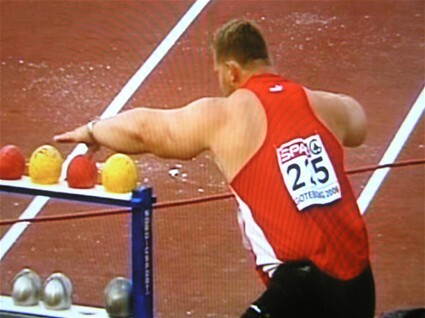 The men´s shot put final, unfortunately was marred by a number of errors in the measurement of the throws. In the photos are displayed four of the errors. Three where it is shown clearly that the point of measurement deviates from where the shot actually landed, and one that was not measured at all. The Videos shows the last throw by Joachim B. Olsen.